This beauty went around Twitter and I had to reach out to Jodi and find out more about this a-ma-za-zing cover! I needed to know the how's and what's of how this cover came to be. Luckily, Jodi was willing to answer a few questions for me/us. Here goes! Did you have any input into the cover before the process started? A little! My editor asked what other covers and styles I loved, and we talked about what kind of things I imagined the art department might do. But I'm soooo not a cover designer, and I knew the art department at KT Books was really good. I trusted them to make all the right calls. What was your very first reaction to the cover? It was a jawdrop! Once I saw the comp, that is. All the cover ideas I'd been hearing indicated they were heading in a direction that didn't involve a girl's face, so when I got an email from my editor talking about models and headshots, I was pretty surprised! Then I scrolled down and saw a girl with a butterfly mask and fell in love. The cover has changed since then -- they ended up hiring a model for the series cover art -- but the basic idea is still the same. And I seriously could not imagine anything more perfect than what it is now. Who designed the cover art and have they worked on other book covers? The photographer is Gustavo Marx, who also did photography for ONCE IN A FULL MOON by Ellen Schreiber, SWEET VENOM by Tera Lynn Childs, and a few others. Art Director Amy (who I'm sure has a last name, I just don't know it) and the art department at Katherine Tegen Books did the rest! They've done other fantastic covers for Tera Lynn Childs' books, ANGELFIRE by Courtney Allison Moulton, and DIVERGENT by Veronica Roth -- just to name a few -- and I can't praise their work enough. They're fantastic! The model's name is Susan. She's playing the part of Ana, the main character of INCARNATE, and she is perfect. She looks just how I always imagined Ana! What is your favorite aspect about the cover art? Okay, if I have to choose one thing, it's the thing I definitely wasn't expecting: the color treatment. I just love the wash of colors through the middle. It sends the whole image to a new level. A level of MAGIC and AWESOME. Is the cover indicative of the beginning, middle, or end of the book? The whole book, actually. While Ana doesn't spend almost 400 pages with a butterfly pinned to her face, this image really captures how she feels throughout the story. But the butterfly IS important and relevant. You gave us a sneak peek of what the inside of the book will look like, HERE, how psyched were you to see butterflies on the inside? SO PSYCHED. I have this thing about the interior design of books. I love looking at copyright pages, endpapers, the scene break markers, and all the other details designers add, but it never occurred to me they'd do special things like that for my book, too. 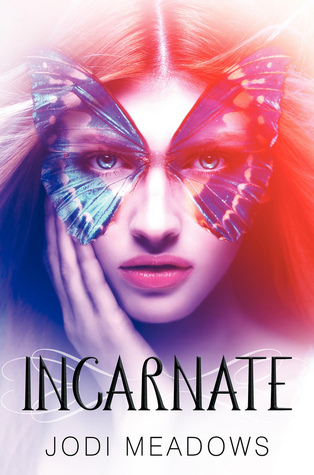 When I saw the title page and chapter headers for INCARNATE, I was just floored. So, so gorgeous. When can people expect to see Advanced Reader/Reviewer Copies floating around? Soon, I hope! I don't think it will be much longer! So, there you have it.....everything you wanted to know about the awesome cover art of INCARNATE. Thank you Jodi for your time today! This went straight on my Goodreads TBR pile....crosses fingers this one is at ALA! You can find Jodi on her website, Facebook, and Twitter.